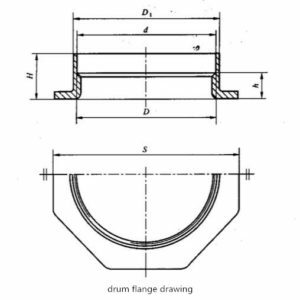 This article mainly offer a guide to drum flange drum plug flange.It falls into the following parts:size,material ,features ,functions and applications .Our steel flanges is mainly used to Steel drums iron drums of 53 Gallon ,55 Gallon , 5 Liter ,46 Liter , 200 Liter ,208 Liter , 210 Liter ,216 Lite.For other Volumes ,please confirm the diameter with us first. Steel drums typically have two openings (bung holes) with flanges, 2″ and 3/4″ in diameter, in the top of the drum/barrel (or cover for open head drums). The flanges are the closure fitting s that are permanently inserted into the drum and provide the receiving threads for a plug. 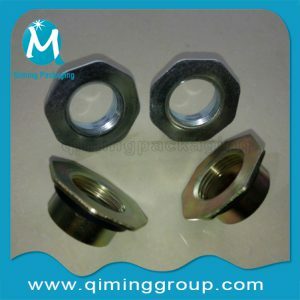 Most steel drums have NPT (National Pipe Thread Taper) threaded openings. Unlike straight pipe threading, NPT threaded fittings will pull tight to make a liquid-tight seal.Once drums are filled with liquid, drum plugs ( drum bungs) are screwed in the flanges using pneumatic or hand operated bung tightener (plug or torque wrench). To secure the contents of the drums against theft and adulteration during shipment, drum cap seals are used. These drum cap seals sit on top of the flanges and are sealed using drum cap-seal crimping tools (also called drum cap sealers). 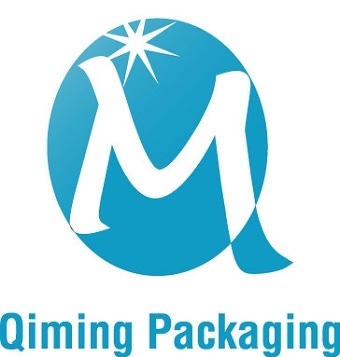 Once drum cap seals are crimped, the plugs can be unopened unless by destroying the drum cap seals . 2 inch and 3/4 inch. Please refer to the following drawings . 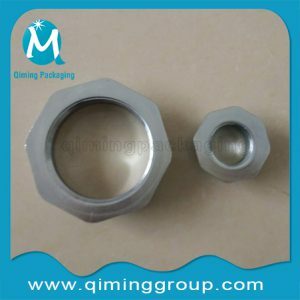 Generally speaking, the shape of drum flange drum plug flange is hexagon base. Round or double hexagon with carving decorative pattern also available. All of our drum flanges are strictly inspected before shipment .Conforming to ISO 9001 :2008 and GB/T13251-2008 Standard. Above is basic guide To Drum Flange Drum Plug Flange,for more information or technical support ,please contact us by mail@qiminggroup.com. Drum Closure Instructions How To Tell Buttress Drum Plugs From NPS Drum Plugs?